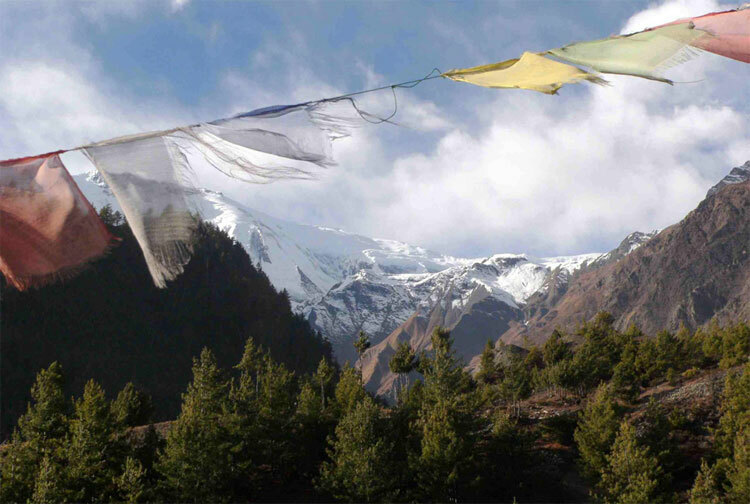 Last Trek Report – Manang November 2008 - Trekking in Nepal with Teresa, Slow Trekking for peoples of all ages. Starting on the 16th November, Barbara is already here (still!) and Carol and Lyn from the surf coast and John from Melbourne (his third trek with us) arrive on the flight from Singapore. It was a lovely warm day and after a quiet lunch on the dining terrace of the BPD it was feet up and a spot of unpacking till our first walk. Steep steps stretch tired jet-lagged legs and by the time we get there the stupa is softly lit by the fading light. We descent through chattering monkeys and hawkers desperate for that one last sale of the day. An early night was a fine option. Our preparation day was the usual hubbub of activity. Sleeping bag liners, trekking poles and the usual paraphernalia were easily acquired. Dollars were changed into rupees – thousands of them and then a nice long walk through Assan Thole, Indra Chowk and Tahiti Thole to see how the Nepalis do their shopping. Its a riot of colours and smells – not all of them good – and busier than Myer at the Boxing Day sales (I know this because I just went a few days ago – I know which I'd prefer). Loaded with danishes for a quick bite in the morning we piled into a taxi and were soon ensconced in the dining room at the BPD, veg curries and thukpas sizzling in the kitchen while we went through our pre-trek briefing. It is a bit of a lecture but has proved useful over time to send the participants out there with a bit of an idea of what to expect on the trail and in the lodges. Nepali toilets need to be explained! Our own little Toyota Hi-Ace collected us at BPD. Despite a nice quick getaway that saw us on the pass over the rim of the Kathmandu valley at 8.30, we then hit serious traffic. Two hours later our van collected us from the bottom of the snaggle. Carol, Barbera, Lyn and I had walked all the way through. It was a clear, fresh morning – well, apart from the diesel fumes from straining trucks – but mostly the traffic just sat there as we wove through it downhill on foot. We saw a lot of curious sights. Trucks full of docile buffaloes, buses full of smiling, amazingly patient, locals and even someone brewing up at the back of their bus. A cup of tea always helps! The trip was magic, especially the winding road up to Besi Sahar from Dumre. Having arrived so late, 3 pm, we decided to stay the night there. The Mongolian Hotel was great. Everything the Sunrise Hotel at Nagarkot was not. It was really quite warm, t-shirts and long shorts, for our first day on trek. 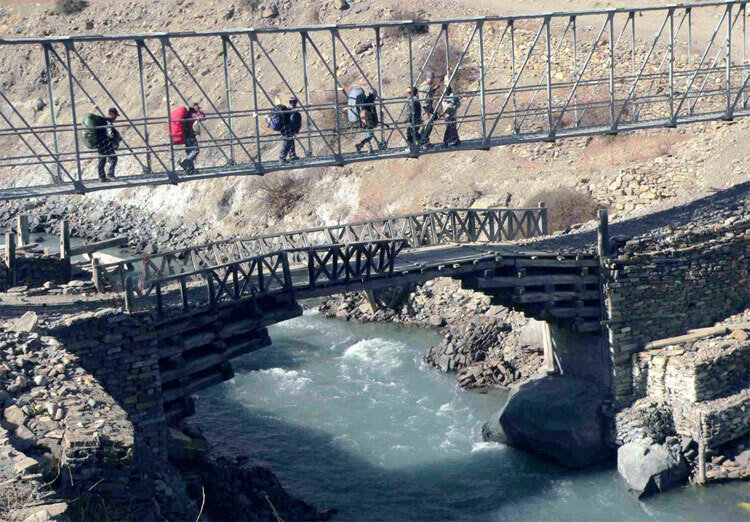 We followed the jeep road to Khudi then crossed the bridge for an easy walk into Bulbule. 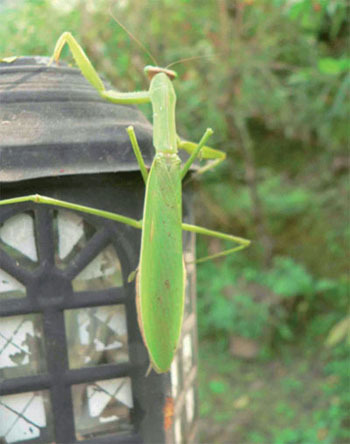 We lunched at the Arjun (already booked our first night here for February 23rd 2009) with its superb garden – tried to photograph a huge praying mantis but it kept jumping onto the camera. The little trail along the Marsyangdi valley is superb, the ketibhati (rice harvest) was in full swing and haystacks were rising everywhere. We saw loads of buffaloes, even one in the river bathing and adorable kids yelling for sweets. Barbera and Carol handed out little, spring-loaded- koalas which the kids loved. Our lodge at Ngadi, was a simple garden style lodge. It was warm so lukewarm showers were fine. Big pumpkin in the kitchen was ordered up for pumpkin soup. We were visited by enough 'rice rats' that night to ensure this was our one and only stop at this lodge. I threw my day pack at one during the night only to have a second one leap out of the bag – an opened packet of biscuits had proved too tempting. From Ngadi its easy going at first but its a hot, dusty climb up to Bahun Danda for lunch with a view. Descending the far side of the ridge through endless little farms, little villages, little tea shops until, finally, after one last steeply descending path we arrived at the huge waterfall and hydro plant of Shyange where our lodge resounds to the gushing water. Lyn, Carol and Barbera detour to watch the local girls soccer match. There is a lot of fun and games at the end of harvest. Our next day was hard. Dammed hard! The trail was broken by new roadworks but at least the cloud cover made things a bit cooler. We took a very long lunch due to a rain delay but decided to push on to Tal. Big mistake. Tired and hungry we shuffled into Tal an hour after dark. It was a 'challenging' evenings walk. It would prove interesting to see that bit of trail in daylight on the way back – water on both sides! Mind you, it was rather exciting. The lodge here was great too. It was really serious up again from Tal in bright, sunny weather. The air was perfectly clear after yesterday's rain. 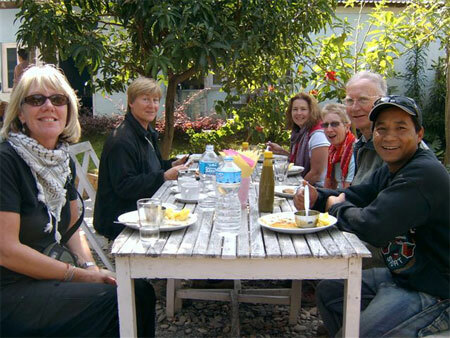 A good lunch at Daharapani fueled us up for more steep climbing to Danakyu. The view back to Manaslu was beautiful – even from my room. Dinner was made cosy by our first fire – a little charcoal brazier. The boys had room in the kitchen for singing and dancing – big time! From Danakyu its straight up through the rhododendron, ash and chestnut woods to Timang. I'd last seen this place 6 years ago in a misty snowstorm so I was bowled over by the views of Manaslu. Through the little cluster of old wooden houses called Thanchock we stopped for a big feed of veggie noodle soup and chips – fast becoming our standard order. A local wedding was taking place in the garden overlooked by our dining room – very entertaining. It was a very pleasant, gentle descent into Chame with its phones and internet access. We were housed in strange little wooden cabins and there was a traditional clay-covered stove in the dining room for another cosy dinner. A leisurely start next day sees us climbing up again, but more gently now. Its over two hours to our first tea stop at Baratang, a shabby wooden shanty. Then it was up again, still fairly gently though, to the new bridge over the Marsyangdi (again). This took us deep into the pine forest. Its still uphill but in deep green shade with an earth track deep in pine needles. We met a lot of local Manangis coming down for the winter with their entire families, usually with half a dozen horses. 'Tashi Delek' is the greeting. Lunch at Dukri Pokhari was long overdue. We ate far too many chips – again! It was an easy walk through alpine meadows into Pisang. 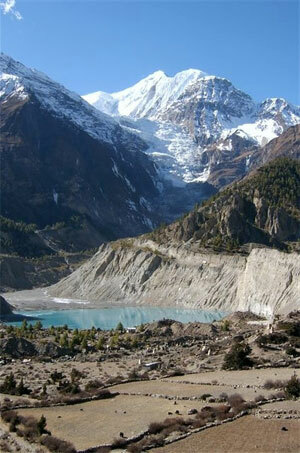 Upper Pisang looks great on the hillside opposite with Pisang Peak looming above it in the twilight. But its SO COLD!!! Our little 'cottage system' cabins seem colder inside than outside. Its another night huddled round the warm stove in the dining room and then lots of clothes to bed – too cold to get undressed anyway. The loo freezes during the night which is a bit inconvenient. Thanks John for the “ICE” sign. I remembered the trek from Pisang into Manang as 'fairly flat' so was not amused to find yet another climb out of Pisang. We sat around at the top of that ridge for about half an hour – unable to keep going – before the long, slow run down through lovely open fields into the Manang Valley itself. It seemed to take ages before Humde hove into view. It was almost flat but we covered a lot of kilometres. Until Lyn's sunglasses fell down the toilet at Braga it was a perfect day. Luckily (well, kind of) the lodge owner knew where and how to recover the specs. Say thank you Lyn! Ugh!!! The first and second lodges we looked at in Manang were disappointing so I set off to find a better one. The lodge we found exceeded all expectations – attached bathrooms with HOT SHOWERS !!! 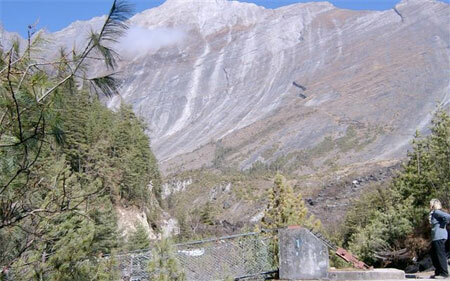 The views from the bedrooms of Annapurna III and the Gangapurna Glacier were spectacular – Barbera and I had a great view of Manaslu from our toilet. The group went out for a day walk around Manang on a beautiful clear sunshiny day. I had a bit of a work session – although with interenet charged at 10 rupees per minute (20 cents) I had to type pretty fast. I found cheese, bread, tuna fish and some ground coffee – all the essentials to sustain us for the return trip. 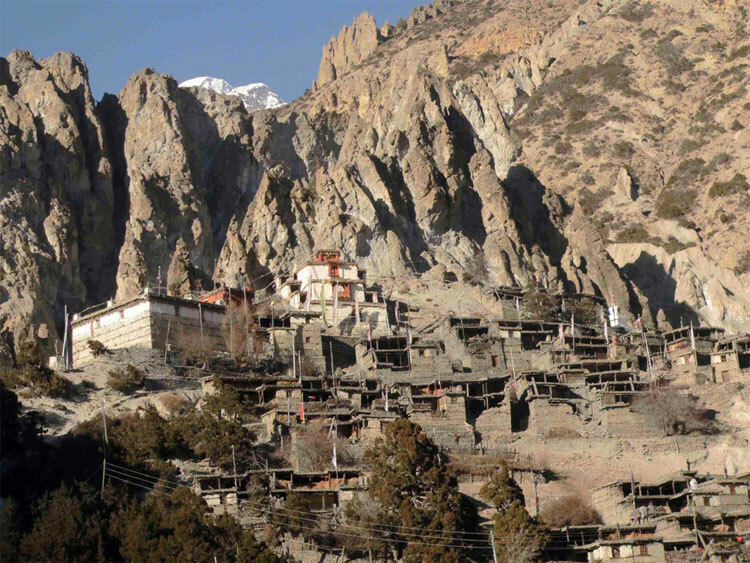 I walked up through the old village of Manang – surely the best-preserved and biggest traditional village in the Anapurnas – to meet the customers coming back. I had only seen Manang in much colder circumstances and was amazed at the bright turquoise colour of the lake at the bottom of the glacier. We walked over to it in the afternoon but the way forward to get really close to the ice-fall was below a rather crumbly looking cliff so we stayed on the near side of the lake. Big off on a clear morning. Hard to leave these shining peaks behind. John had decided to fly down from the little grass airstrip at Humde so we left him with Mangal and Purna at the immaculate little Snowland Hotel to fly down to Pokhara the next day – be warned though, this option is not available during the Spring season (airstrip too boggy). 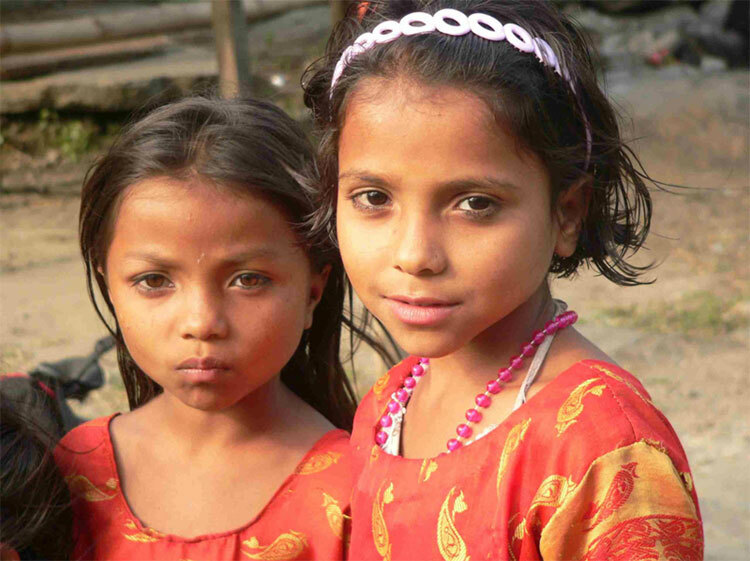 The boys hoped to catch us up by about Jagat. Fat chance!! The rest of us – four strong women – get a move on and decide that we can make Chame in one day. It was tight. We got in at 5.40, just after dark, but the trail into Chame is pretty easy at that stage and the moon helped. We ate huge dinners and opted for a very early night for our tired bodies. It looks as though we covered 27 kilometres of rough terrain today. Well done us! Next day was well-paced, up over Thanchok for a long sunny morning tea and then Timang for lunch. Facing Manaslu all the way was spectacular. Descending through dense green rhododendron forests where a dozen monkeys were drinking at the river. Black-faces with white manes. We made it all the way down to Daharapani to the flash-looking lodge we had lunched in on the way up. It looked flash (attached bathrooms) but the owner was surly and I don't think we would choose it again. Purna and Mangal arrived about ten minutes after us – they had literally 'flown down' without John's luggage. I thought this next day was our hardest. Relentless downhill, then up, then down to Tal. We took a seriously long lunch break in the garden of the lodge where we'd stayed on the way up. Its nice sometimes to meet up with the same families you befriended on the way up. The garden was full of marigolds and cosmos and huge tree dahlias. Veggie omelettes and chapatis went down well. Rather unwisely we had a go at reaching Jagat. It was a bit too far. Stopping for a final cuppa at Chamje the lodge looked good so we called it a day. The lodge owners were Tibetan, with mum chanting on a mountain of blankets just inside the dining room door and various 'characters' dropping by. Some local lads started a screaming match in the middle of the night – well into the rakshi – which I tried to shut up with an equally loud plea to 'shut the f...k up!”. Of course, they told me where to get off but they drifted off down the road, cursing all the way. Some local guy's wife wouldn't let him in because he was drunk as a skunk – go figure? Luckily, I've figured out that we have at least two more days for this trek next season so we won't need to push it this hard. With these three strong women for customers, it's all I can do to keep up. From Chamche down the weather got warmer and warmer and we were back in shorts and t-shirts. This is a fabulous valley with waterfalls gushing out of the hillside at every turn. The forest is a positive jungle in places. Shange was easily reached for lunch with its old dining room hanging over the river – don't look through the gaps in the floorboards. Best chips on trek! The long, warm afternoon was very relaxing walking. At one place the boys found sugar canes for sale and quickly set too with a huge curved knife to cut chunks of the sweet juicy stuff for us. The climb up the ridge to Bahun Danda was almost too much at the end of the day but the thought of hot showers spurred us on. Sitting at the tables under the trees with clean bodies and our last clean t-shirts on, we felt pretty pleased with ourselves I think. This place makes excellent spring rolls and some tinned tuna went down well. I even had a beer with the Germans. “ Fraternising with the enemy”?? Our last day on trek was a beauty. Really warm now – hats and sunscreen all day. Lunch at our old favourite lodge in Bulbulle. Found fresh fruit for sale on the roadside and gorged on oranges and bananas. We let the boys take the jeep with the luggage for the last couple of hours – the rest of us determined to walk the whole way. The Mongolian Hotel was as good as ever. Surprised to meet so many people setting off for the Anapurna Circuit so late in the season but I met a few of them later, here and there in Thamel, and most of them made it quite comfortably – luckily, there was no early snow this season. If anyone is interested, Frank Jones and I have decided that next November's Manang trip will include the option of 'going over the top' – Thorong La Pass !!!! We hired a local minibus to ourselves and sped into Pokhara on a high. Mangal and Dorje headed straight home to Kathmandu and we will see them later. Great to cover so many kilometres with so little effort. Lake Diamond was ready for us – masala omelette in a toasted brown roll with fresh tomatoes – thanks Sanu. 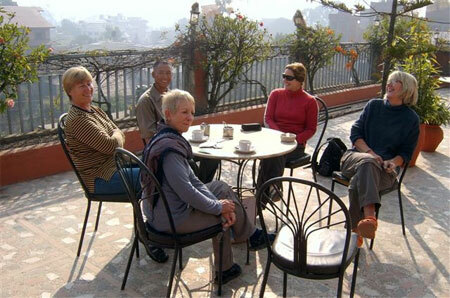 Reunited with John again – he looked so relaxed and refreshed – who had obviously had a happy visit to Pokhara. I can't remember much about Pokhara. Must have been exhausted. We had a nice meal at the Boomerang where there is a cultural show in the evening. The boys ordered up big – tuna pizza, steak, chicken burrito, to name a few. Bus back to Kathmandu – so goodbye to the rest of our porters – Lahar, Barrat, Purna and Kaji. We will miss your music and your smiles. The BPD was full up for this visit so we checked into the Norbu Linka. The rooms are rather nice, especially up on the fifth floor, and though the food is unremarkable, the cafes of Thamel were on our doorstep. The Roadhouse proved a big hit and we even got a free pizza because I took them some prints of photos I took a year ago – mainly the cooks. This pizza is real 'Carlton' standard and the house wine is Australian – what more could you want after trekking. Our last day in Kathmandu we managed to squeeze in shopping, a visit to Kopan Monastery and Isabel's nearby project and then a lap or two around the huge old stupa of Bodanath. It was late afternoon and the place was teaming with Tibetans, many of them in their traditional garb, prayer wheels spinning, chanting out loud. Its always sad when the group breaks up but Lyn and Carol stayed on for few days. We visited the BPD's lama dancing puja. It was a riot of colour and sound – from the solemn softly-chanted prayers to the outrageous cymbal-clashing acrobatic dragons. The yellow canvas 'roof' over the courtyard had the feel of a big top and the place was chock-a-block with local and international visitors. No wonder we couldn't get a room there. Our 'light lunch' at Mangal's house was delicious and I won't ever forget singing 'Hey, Big Spender' with Lyn at Bima's jewelery store in Kimdol. Some customers make my job a dream! Thanks folks. You were great. PS I am running this trek again on February 21st. That is not far off. I only have about 7 confirmed bookings for this one so there is a bit of room. Call me at home in Woodend on 03 9315 9617 or email me at teresadidi@slowtrekking.com or vonschwichtenberg@gmail.com, teresadidi@slowtrekking.com or have a look at the website at www.slowtrekking.com. I will post the itinerary shortly. 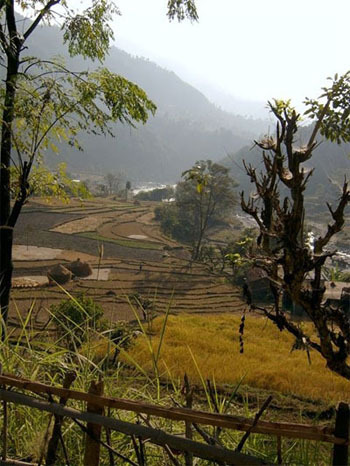 This trek may sound a bit hard but the altitude is not a big problem, there are no scary flights, dependent on good weather, and next season has a longer itinerary so we won't need to go so hard. YOU CAN DO THIS !!!! PPS Thanks to John van der Schoor for some of the pictures and Frank Jones at Desktop Dynamics in Geelong ofr editorial assistance.